The Orange County Marine Protected Area Council (OCMPAC) is the state’s oldest MPA Collaborative, started in 1999. 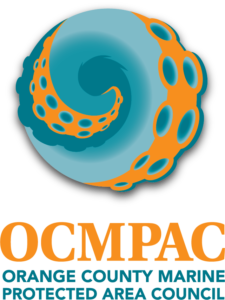 OCMPAC is a collaboration of city and county officials, institutional representatives, environmental advocates, academic faculty and nonprofit organization members. OCMPAC’s accomplishments have included county-wide signage, enforcement trainings, education programs, research & monitoring, and teacher workshops. Based on their success, OCMPAC was used as a model for the development of the statewide network of Collaboratives. In addition to establishing programs for docent education, public outreach, and consistent enforcement, OCMPAC is actively engaged in a range of citizen science projects that monitor the health of Orange County’s MPAs. MPA Collaborative In-Kind Value Assessment: A project to quantify the value of services added by their MPA Collaborative. Completed in 2016. This handy guide highlights some of the species that can be spotted within tidepools around Orange County. This brochure provides general information and a map of Orange County’s MPAs.